I ran an 8-Bit Demo game of Super Dungeon Explore for James and Luke to get used to the basics of the game before moving on to the proper 16-Bit, Super and Ultimate levels of the game. James took the Paladin (because it looks like him!) while Luke took the Dwarf and they began hacking their way through through the basic game. The guys really got into the swing of things quite quickly and started having fun unleashing all manner of special attacks, swapping potions, picking up Loot and equipping Treasure. We had a fantastic time playing the basic 8-Bit game, but it still took some serious preparation on my part. So I recommend that you do the same if you're introducing people to Super Dungeon Explore for the first time. They'll get bored sitting around for 2 hours while you're reading the rulebook otherwise! I spent a good hour or two reading through the rulebook very thoroughly while having everything laid out in front of me. Some parts of the rulebook aren't very clear -especially where certain counters have been changed during the production of the game. But once you grasp the basics, it's plain sailing from there. However, some of the rules require a little common sense based on other rules in the game. So for example, the Dwarf's "Cleave" attack is performed just a regular attack, but it took us a while to work this out and make sure that's exactly how it was intended. However, once you've read through the rulebook a couple of times, the summary at the back makes a lot of sense, as does the glossary of status effects on the opposite page. 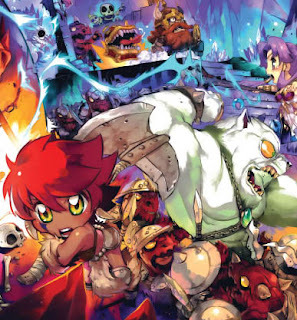 But essentially the game is a like Disgaea, Hero Quest and Gauntlet thrown into a blender. If you've played any games in the Disgaea series on the Playstation, then the area effect attacks and 'mobbing up' will be familiar to you. However, this is where you may need to be lenient as the Dark Consul (aka: dungeon master), because you can quickly obliterate anyone who is unfamiliar with this sort of game. Having played Disgaea for years, I was quickly able to identify how to use the various dungeon denizens and minions to maximum potential. But that wouldn't have made for a very enjoyable game for the other players. Once you've played through one game then all of the rules should make sense for any future games. My two players were brilliant and got straight into the action without hesitating. Luke really relished his role the the stubborn, hard-as-nails Dwarf with a "great cleavage" as Luke put it whenever his Dwarf unleashed his "Cleave" attack. Meanwhile James excelled as the Paladin, dishing out plenty of punishment while healing himself and Luke's Dwarf to the point where they were practically invincible. Well, they were invincible until the Paladin was surrounded by Kobold Gougers who pokes at him with their pointy sticks using their Mob special rule to inflict lots of damage! However, it was at this point that I realised I needed to tone down my typically ruthless tactics to give the heroes a chance of actually winning the game. My players wouldn't come back for more if I slaughtered them mercilessly and they wouldn't stay interested if I made it too easy for them either. Because Luke and James had chosen melee characters, I made sure that I only spawned melee minions. Tempted as I was to form a shield wall with Kobold Ironscales and batter the heroes from a distance with 4 Kobold Flingers, it wouldn't have made the game much fun or helped Luke and James get to grips with the game mechanics. But once the Heroes had gotten their hands on some awesome Loot cards, they began butchering their way through the rapidly spawning Kobolds before taking out the Spawning Points and then cutting down 'Rex' the Kobold Ogre Mini-Boss. By this time the Dwarf had a Green Dice is his attacks and seriously wounded Rex, before the Paladin came in and finished him off with a coup de gras! Luke and James loved how powerful their characters were becoming with every kill and as The Dark Consul, I had plenty of minions to throw at them or strategically combine to create difficult obstacles in their path. After the game, Luke and James has a very good understanding of the rules and were keen to read about the 16-Bit and SUPER game levels as well as the different Heroes available. Having played just 1 game, suddenly all the rules made perfect sense to all of us. We could clearly see what made each Hero special and since then everyone has been eager to try out the Claw Tribe Barbarian in our next game. She seems like wonderful killing machine thanks to Rage and Backlash. However, the Hero of choice for any party is always the Paladin. His healing is just too good to leave home without. 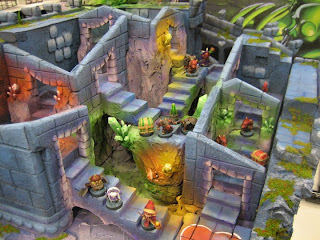 In the meantime, stay tuned for some more games of Super Dungeon Explore - and next time I'll take some pictures too! 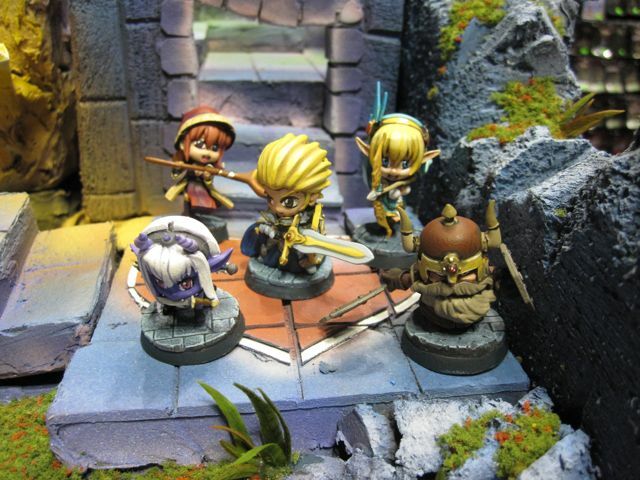 Have you got your copy of Super Dungeon Explore yet? If not, get it cheap online from Wayland Games before stocks sell out again. This is the best board game I've played in years. Yes, it's even better than Space Hulk! One thing you said made me think, that you could spawn 4 kobold slingers, which in an 8-bit game would not be true, because the Consul only gets 2 kobold flingers in his reserve for a pair of kobold warrens. You also said that you only used minions, but in an 8-bit game you only can use minions, you cannot have the Dragon Denizens unless you have an egg spawn point, which without two copies of the game is impossible. Also how did you use Rex? Did you follow the normal 16bit monster spawning rules or did you use him as a boss and spawn him when the power gauge hit super? Correct, I only produced Minions, not Denizens in this 8-Bit game. Just as well I didn't field any Kobold Flingers then! I could field more in a larger game with more Spawning Points though. I spawned Rex as though he was a boss when the Power Gauge reached 16-Bit. I didn't make the Power Gauge go any higher because the heroes were struggling to kill things at this point. Have played two games so far and am loving it! The first was pretty bad though as I was reading the rules while one other person was playing two characters which makes it really hard for them to enjoy. As for the 8-bit rules I've done just as you have done and spawn Rex when the adventure tracker gets to 16-bit as I also found the players struggling at this point. This showed up at my apartment yesterday!..but no one was home!!! It will arrive today though, and, after reading this post, I can't wait! SRPGs are my favorite kind of video games, and everyone keeps comparing it to Disgaea. So excited. How was the assembly process? And the overall quality of the minis? Did you use plastic glue? I was planning on it, but would love to hear from someone who has handled them already.